The Metropolitan Museum of Art, located on elegant and timeless Fifth Avenue in New York City, houses over two million works of art and is one of the most visited museums in the world with seven million taking a peek each year. Somehow the museum was able to pick out roughly 200 paintings, prints and sculptures. Although one can easily imagine that the museum loves all two million, I (Heart) Art distills the museum experience into a non-overwhelming yet entirely stimulating exposure. The chunky six-inch by six-inch book is divided into 11 color-coded sections each representing a distinct category: art; play; sports; music; singing and dancing; reading, writing and drawing; animals; family; locomotion; the country; and the city. Each category is prefaced by the words I (HEART) consistent with the title— for instance, I (HEART) Sports. This strategy is relatively important because it is the only indication that this book is intended for elementary school aged kids. With a high quality of design, execution and presentation, the production of this pint-sized book rivals that of the massive exhibition catalogs that dominate the gift shop shelves. Young children will feel very sophisticated grasping this book in their souvenir sack. The fact that they will be able to comprehend the contents will only add to their confidence and satisfaction. Text is reserved for the section heading pages only and is kept consistent and minimal. “Who doesn’t (Heart) sports? Running races and swinging mallets, Wrestling stances and fencing feints, Sliding bases and training ropes, There are so many sports to choose.” A poetic prose that is thankfully free from cringe producing cliché rhyming schemes. Focus, therefore, is on the artwork. Variety is widespread and encompasses the depth and breadth of the full Met collection. Kicking off the sports section we find a detail of an 1872 Monet painting of the artist’s son Jean Monet on his Hobby Horse. Sadly, it is only a small detail of a larger painting which would have been nice to see complete. Fortunately this snippet is the exception and not the rule and most artworks are shown in their entirety. We then jump to a Boating Party with Children Swimming, a late 18th century woodblock by Japanese artist Kitagawa Utamaro. Sports continues on with a 1787 Goya, a 1st century Mexican ceramic, a mid-century American watercolorist Jacob Lawrence, a 1475 Italian tempura painting, and Winslow Homer’s classic Snap the Whip from 1872. The selections in the sports section are indicative of what to expect in the other sections. Not only is there variety in the artists and mediums, but in the sporting activities—the subject matters—as well. Actually, this choice of subject matter in each section is what is so intriguing about this book. Particularly relevant for the target audience, making all of these artworks intimately recognizable as important universal aspects of humanity throughout the ages. Kids’ horizons are bound to be widened when they see Milton Avery’s 1929 oil painting Steeplechase and wonder, ‘what the heck is a steeplechase?” Or seeing Suzuki Harunobu’s 1766 print Kite Flying depicting three Japanese figures engrossed in their success, admiring their flapping kite as it wafts in the sky above a calm sea. Recognizing the activity, the kids will gawk at the costumes and hair styles that seem so foreign and strange. This, after all, is the point of art and the purpose for collecting it in our museums: amazement, awe and wonder. What I (HEART) Art offers is the opportunity for the young museum goers to continue their relationship with curiosity. Having their own little piece of it to tuck in their backpacks, or covet on their bedside tables, will no doubt foster imagination and generate questions. 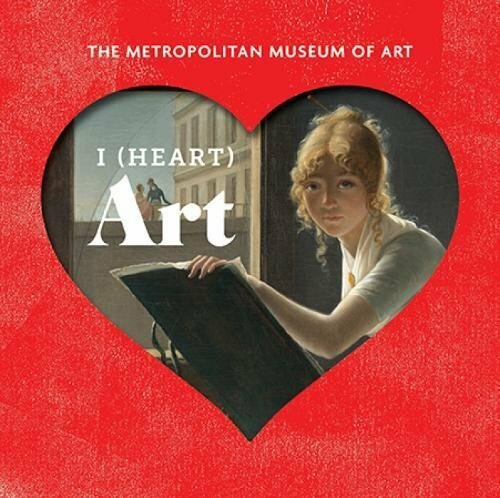 I (Heart) Art gives youngsters their own elegant and timeless pocket museum that they can visit time and time again, independently, at their own pace, and, above all, with their own thoughts.